In this interview, Richard Rose discusses collecting vintage Ericofon telephones of the 1960s, and trends in telephone collecting in general. Based in Minnesota, Richard can be reached via his website, Ericofon.com, which is a member of our Hall of Fame. I like mechanical things. I’ve collected outboard motors, things like that in the past. I got into the telephones probably 15 years ago, and I’ve been there ever since. Starting to collect all the Ericofon colors was just an attempt to try and find out everything there was to know on the Ericofon. Since little information was known on the Ericofon, I made it my mission. And I decided to build a website so other people wouldn’t have to do the same research. I picked the Ericofon because I happened to get one at about the time I was looking for a challenge in phone collecting. I was going through the motions of buying and displaying phones and needed more of a challenge. The Ericofon is a pretty interesting and unusual phone. Basically, it was designed in the 1950s by the Swedish company L.M. Ericsson in an attempt to develop a one-piece phone. And it became widely successful, probably one of the biggest selling phones in the world. They started selling them in America once they got the Bell System to allow them, and they got so popular so fast that they decided to make them in America because it was easier than importing them. They already owned part of a phone company called North Electric, so they had North Electric build the Ericofon for the American market here. So you’ve got the North Electric Ericofons which were marketed in the United States, and the L.M. Ericsson Ericofons that were used in the rest of the world. At that time, America was by far the biggest phone market in the world, so North Electric’s production was much bigger. They had to start out with mostly institutional buyers and independent telephone companies because they couldn’t get them out in the open market with consumers at first because of the Bell System. So hospitals and businesses and things like that. The Bell System had a monopoly on the market, and they would dictate what you could use in your home for a telephone. But the Ericofons slowly made their way into the private homes, and at one point in the late 1950s, the idea just became very popular. Everybody wanted one all of a sudden, and they took off. Eventually Bell got to the point where they said, okay, you can use an Ericofon, but we’re still going to charge you as though it was our phone (all Bell phones were rented at that time). They were pretty harsh about it at first, but they ended up relinquishing after a while. This was the modern phone to have. People who had a modern house – that was their marketing push. They marketed the more modern look and the convenience of a one-piece phone. Collectors Weekly: Who’s interested in Ericofons now? Rose: Mostly people who are nostalgic. We had one in my house when I was a kid. My grandparents had one. I do get people once in a while doing retro decorations. The recent popularity of mid-century modern design has in fact spawned a couple of Ericofon knockoffs. Pottery Barn did one. People are willing to pay for a cheap knockoff just for the look, so they’re using them for decoration. But there are still a lot of the people who are willing to go further to put an original in their home, even if it has rotary dialing. They’ll still use them. “Accent Green”, a Kelly green. This color was eliminated in the early 1960s. 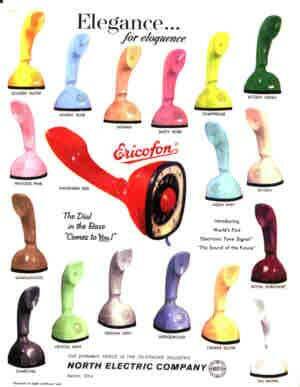 The Ericofon was a huge design advancement in its time. It weighs 13 ounces. At that time, most phones weighed five or six pounds. 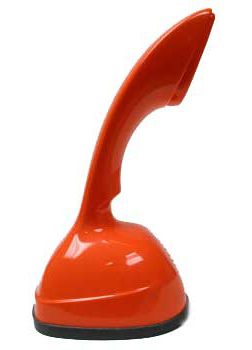 Its been recognized as one of the top 20 designs of the 20th century because it was so advanced. It was big enough to get Western Electric’s attention. They went on to develop the Trimline phone. You can almost credit the Trimline phone, which is a common phone today, to the competition with the Ericofon. 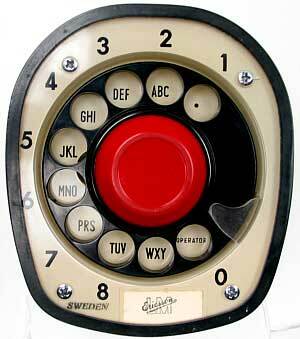 That was Western Electric’s way of getting the dial into the handset. They wanted it to compete with the Ericofon. With Bell phones, it was basically a box on the desk with the handset from the 1930s all the way to the 1950s. And then along comes this Ericofon with its radical design. And people wanted it. They revolutionized telephones by going from big, heavy, bulky phones to the lightweight one-piece phones. The heyday of the Ericofon in the U.S. was probably about 1960 to 1972. They were made up through 1984 in Europe, but in the United States, they stopped making them altogether in 1974. People just got burned out on the idea. It looked too ‘60s. They redesigned it in the ‘70s, modernized it by squaring it off, but people just didn’t go for it. People were just done with the design. Plus they never made a Touch-Tone. Back in mid ‘70s, everybody was going Touch-Tone. They developed a push pad for the Model 700, but left it as pulse dialing like a rotary dial. Collectors Weekly: Can you tell us a little bit about the Ericofon color palette? Rose: They started out with 18 colors. And after a few years, they went from 18 to eight, I don’t know why. It depended where you were in the world, which colors you could choose from, because they made different colors for different markets, always within that palette of eight. Near the end, they introduced a couple of new colors. They did harvest gold and then the brown, which in the ‘70s was very popular, the earth tone thing. They also did some novelty colors. Some clear. And some plating. A lot of those painted ones were done by phone companies, the metallic paint jobs, things like that, or there were special runs made. Somebody in Denmark did a bunch with leather covering. Those weren’t actually done by the factory. The factory basically just did the eight colors, and that was it. The plating and painting, I think, were done by phone companies themselves just to help sell the phones. They were trying to use up the old shells with the colors that nobody wanted. Collectors Weekly: What colors are popular now with collectors? Rose: The most popular back then were the earth tones – the tans, the whites, ivory – that’s what you find the most of. Today what’s popular are the odd colors like the red, the aqua, and the pink. Those are harder to find, they didn’t make as many. Back then they weren’t to trying to decorate with colors. It was utility, you didn’t want it to stand out. You wouldn’t paint your toaster bright red. Now because people are decorating, they want them to stand out so they’re buying the funky colors. In most countries back then, the Ericofon base palette was red, green, gray, blue and ivory. In the the United States, add to that aqua mist, petal pink and white. In some countries, you can only get it in two or three colors, like in England, where it was in white or orange. In the Netherlands, you could get it in red, white or brown. Each country had its own palette. Collectors Weekly: Do most Ericofon collectors just focus on the colors? Rose: No. I do know a couple of Ericofon collectors who focus on the chassis, try to get all the different chassis. The shells are all identical. But there are at least 25 to 30 different chassis, chassis meaning the inside. There was quite a bit of variation, depending on time and location. I mostly concentrate on color. If I come across a chassis I haven’t got, I’ll put it in one of my phones. So I do pay attention to chassis, but I don’t look for them. There were two basic designs, I call them old case and new case. What happened was they changed the height of the shell by about three quarters of an inch, and changed the shell design slightly around 1960, made it a little shorter and a little more angled. The old case is a little bit taller, and the new case is a little bit shorter. It had to do with manufacturing. The first shells were made in two mirror halves that were glued together. They wanted to be able to make the shell in one piece. So mechanically, for designing the mold, it made it easier for them to actually change the angle and the height a little bit of the shell. So it wasn’t an aesthetic change. There were also just two ringers, the Ericotone ringer in America, and a buzzer for everywhere else. Most of my buyers are nostalgia buyers, so they want one with the ringer from where they grew up. So when I sell to Europe, its always the buzzer. Collectors Weekly: How many Ericofons do you have in your collection? Rose: About 80, I think. Each one has got slight variations. I’ve found them all over the world, but the majority are probably from buying from eBay. It’s tough to get them now. You don’t see as much of the rare stuff anymore now that they’ve become popular again. The rare ones tend to go for a lot more money or don’t even hit the market. The demand for Ericofons has gone up quite a bit, mostly from Europe because it was so popular there. Also because the dollar is so weak, anything from America is a bargain to them right now. So a lot of Europeans have been snapping up the rare stuff lately. It’s a two-edged sword there. The weak dollar makes it easy to sell but tough to buy. Another trend is that there’s an appetite for the real rare stuff. I auctioned off an Ericofon collection for someone last fall. It went for ungodly amounts of money just because they were so rare and collectible. The plain Jane Ericofons are still running $25 to $35, but you get something very rare like a mint condition accent green, you could get $2,000 to $3,000 for it. 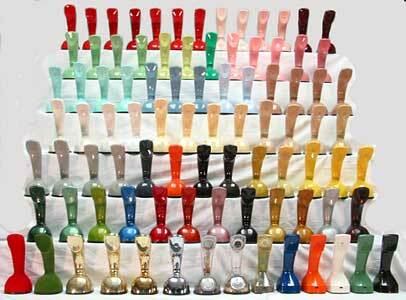 I had 18 Ericofons up for auction, and its grand total on the sale was $20,000. I couldn’t believe it. It’s getting to a point where there are more collectors than there are phones. Most of these people are not general phone collectors, by the way. Ericofon collectors usually specialize in Ericofons. I’m rare in that I collect regular phones and Ericofons. Collectors Weekly: Can you tell us about the survey you do of telephone collectors in general? Dial face: This is the first dial face brought to the USA. Rose: Sure. I did it five years ago, and thought it would be fun to run it again and see if the results were the same. My theory is that most collectors are baby boomers. And that people collect mostly what’s from their era. The survey asked the age of collectors, and more collectors were in that baby boom bubble than anything else, which makes me wonder what’s going to happen to telephone collecting when baby boomers start heading for the nursing homes. I think in the next 10 years, you’re going to see floods of old phones on the market, and it’s probably going to kill prices because alot of these people are going to be giving up their collections. And who’s going to buy them? I think it extrapolates to all collectibles, people collecting Barbie dolls and lunch pails. You don’t have a teenager now interested in lunch pails because they don’t know what they’re all about. People collect what’s from their childhood. Collectibles are doing well right now because the baby boomers are that age where they’ve got the most disposable income to buy stuff like this. But that’s going to end. The world of collecting, I think its days are numbered. There will always be collectible markets, but I think it’s just going to be a lot smaller, and what’s collectible is going to change. Telephones will fall by the wayside because people who grew up in the ‘90s, there’s no phones that they’re going to be attached to when they’re older. Collectors Weekly: But the telephone collecting hobby has grown in the last five years? Rose: I don’t know if it’s been growing or if its just the number of phone collectors online that’s been growing. But I did get more responses in 2007 than in 2002. If you look at the age range of the people, compare 2002 to 2007, the age group is more dispersed. We’ve got many more young people on there. I’ll probably do the survey again 2012, though it’s a bit of work compiling all that information. It’s also hilarious some of the answers you get. Another theme from the survey is that what interests people the most in telephone collecting is the hunting. People really like trying to find telephones. There have also been shifts in the types of phones they’re looking for. Look at the wood phones. Back in the ‘80s, everybody was decorating in the country style, and the wood phone prices went skyrocketing. Nowadays, you almost can’t unload wood phones at any price. They have to be really special to be able to sell them. The people who were of an age that they used the wood phones, they’re not collecting anymore. They’re too old to collect them, and that’s going to happen with the other phones too. People from that era are going to be too old to collect. You’re just going to be a huge glut on the market, and prices will plummet. Collectors Weekly: So what types of phones are popular to collect right now? Rose: The 1960s and ‘70s phones, because the bulk of people with buying power are moving into that age bracket now. They were born in the ‘60s or ‘70s. They’re starting to look back and what was part of their childhood is now part of their memorabilia. I’m selling a lot of Sculpturas, those doughnut-shaped phone from the ‘70s. When I was collecting outboard motors it’s because I had an interest in mechanical things. You’ve got to have an interest to begin with, but I think the major driving force in collecting is the memory stuff, wanting to buy back a piece of your youth. And getting new people interested will be tough if you think there’s nothing that was made in the ‘90s that’s worth going back to. Maybe in 20 years, we’ll see. The classic collector line is “God, I was throwing those away when I was young.” So who knows what tomorrow’s collectibles will be. You’ll see something sold for a fortune on eBay and say, I had one of those. I had a 1962 Cadillac with the big, huge fins on it, convertible top and everything; I sent it to a junkyard for $40 because at that time it was piece of junk. Nowadays, look what it would be worth now. Collectors Weekly: What advice would you have for someone interested in becoming a telephone collector? Rose: Collect what interests you. Look around until something barks at you. Set a goal, a challenge, think of something that would be a challenge and go for it. Don’t just go through the motions of buying and displaying. Maybe try and get one model of everything Western Electric made. I’ve got every color of the Automatic Electric Space Saver. I don’t advertise it or anything, but I have them. You have to have goals, a challenge. And as for buying phones, talk to people who know. Phone collectors love to talk about phones. They will talk your ear off. Mid-Century Modern Furniture, from Marshmallow Sofas to Hans Wegner Chairs Kem Weber: The Mid-Century Modern Designer Who Paved the Way for IKEAThis 1959 Goggomobil Is Insanely Cute and Gets 55 MPG. Why Can’t Detroit Do That? Great information from someone who knows a lot about coloured sets. Very interesting article. I don’t know how Richard has the time to do all he does. The other point he didn’t mention is how much help he has given to others. Yes the ERICOFON is an “ICON” in the COLLECTORS WORLD. HERE IN AUSTRALIA there where only 5 OFFICIAL COLOURS. I have managed 15 COLOURS& still looking. A brilliant and thorough article from Richard who, in my view, is not only the world’s leading authority on the Ericofon, but also always so willing to help those who approach him. His help has been of enormous value to me and I wish him well for the future. Without doubt the biggest collector of ericofon in the world. Their web site and he provides incredible help to those who collect these phones. Makes a priceless work, L.M. Ericsson will have to put on the payroll. I also am an Ericofon fan, but only have one and I also have an extra dial pad. It’s the pale green, works perfect. I never knew there were so many colors. What a great, ahead of its time, phone to have. Contact me if interested in all my other collections. Been collecting since I can’t remember. Lots of Princess and Trimlines,Trendlines all colors,also old black phones. ericco phones rock!! !..they are one of the most eligant and usable phone… we also deal in very old telephones which include the siemens and the gec telephones…I do have ericco phones…and one of it is with the box of it and with very good condition ,if interested contact me…. what was the price of the ericofon when first invented? 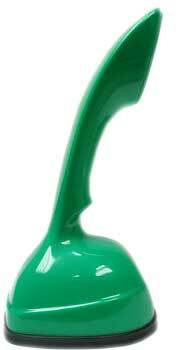 In Sweden the model is called “Cobra/Kobra telephone”, relating to its shape like a Cobra snake. “ ” Even though we have ray guns and amazing flying machines, we wear top hats and wool jackets.